Arq provides a straightforward and easy backup solution. If you need to make backup copies of important files, but you don't want to spend too much time setting up a backup program, then Arq is definitely for you. The software can store your backups in the cloud. It supports a wide range of cloud services and the best part is that it doesn't require too much user input. The software is free to try for a limited period of time, but without any functionality restrictions. Downloading the setup package takes only a few seconds, due to its small size. The installation process is just as fast and it doesn't involve any complicated settings. Furthermore, there are no special requirements you have to meet. Backup jobs can be set up just by selecting a source folder. When launched for the first time, Arq will help you connect to one of your cloud accounts. Specifying a user name and a password is sufficient to connect to an account. Source and cloud folders are displayed in a tree structure, on the left side of the main user interface and you can make the tweaks you need in the larger area on the right. Backed up folders are displayed in both the source and cloud parts of the tree structure. 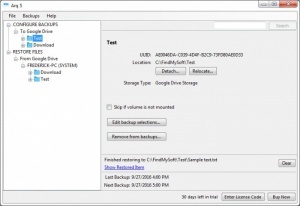 Backup selections can be edited at any time, if you need to add more data to the backup queue. Also, you can remove specific bits of data from the backup queue, relocate the source and more. If you wish to restore data, you can choose one or more files, on the same interface and just click a button to download them on your hard drive. With Arq, you don't have to worry too much about backing up your important data, because the software will take care of everything for you. You can set up an automatic backup job, just by selecting a source folder. The application lets you make various tweaks. It provides support for a wide range of cloud services. There are no obvious design flaws of functionality gaps to address. You can download Arq free here.